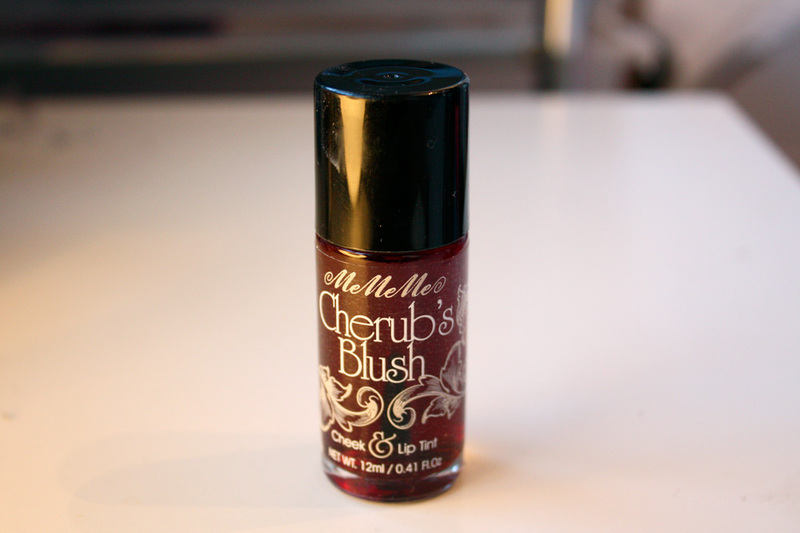 I received this full size (12ml) bottle of MeMeMe’s Cherub’s blush lip tint in a Glossybox last year sometime, I’ve only just got round to testing it out! Whoops! I don’t own any liquid tints so was intrigued to see how well it would work in comparison to normal blushes. 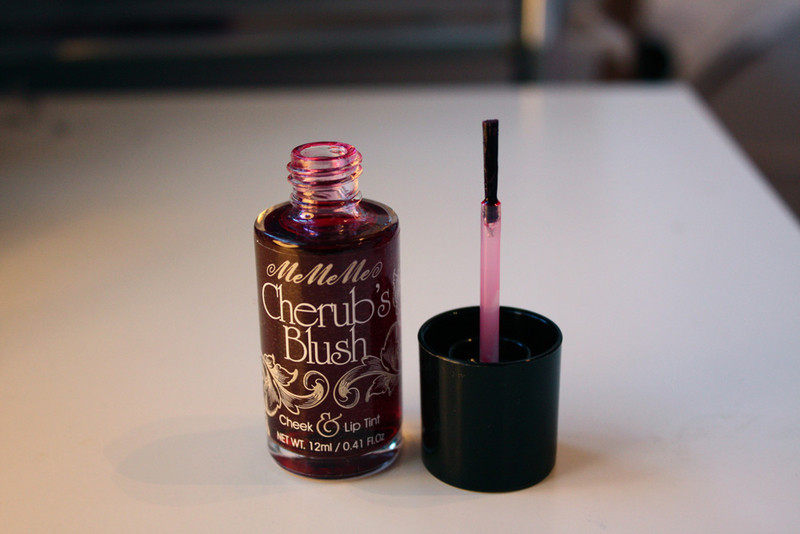 Cherubs blush is a dark red Turkish delight (rose) smelling watery liquid, it comes in a glass bottle that looks similar to a nail varnish. Be careful when opening it though! 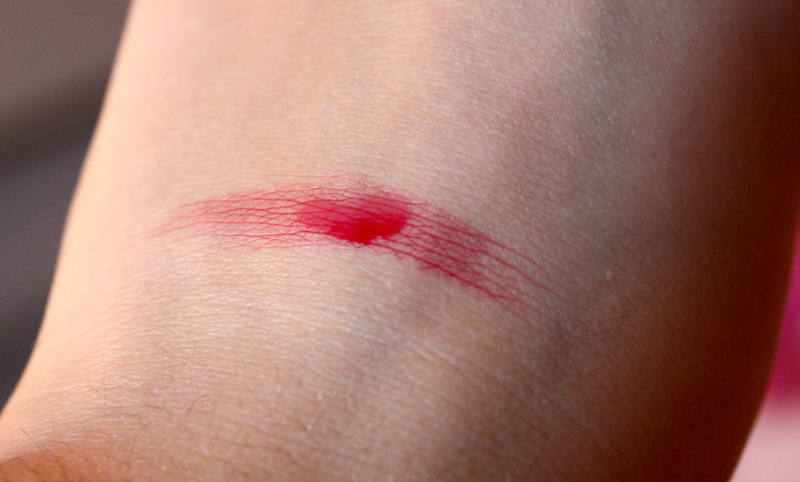 It has a long brush in it (similar to that of a nail varnish) so unscrew it and lift it out, don’t do what I did and flick the product everywhere because you didn’t realise it even had a brush in it! Fail! It’s a dual purpose product so can be used on both the cheeks and lips, I’ve tried it for both and prefer using this as a lip stain as it literally lasts all day. Be warned though it tickles so much when you apply it directly to the lips! (maybe that’s just me though!!). TIP use a good lip balm over this to give your lips some moisture and it’ll add a nice subtle gloss. 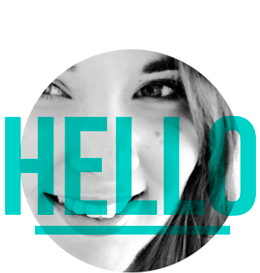 You can see where I left the product when I took the picture above this one, so blend fast! It’s best to use liquid based products over liquid bases, so I’d advise using this over naked skin, liquid foundation or BB cream/tinted moisturiser for the best results. 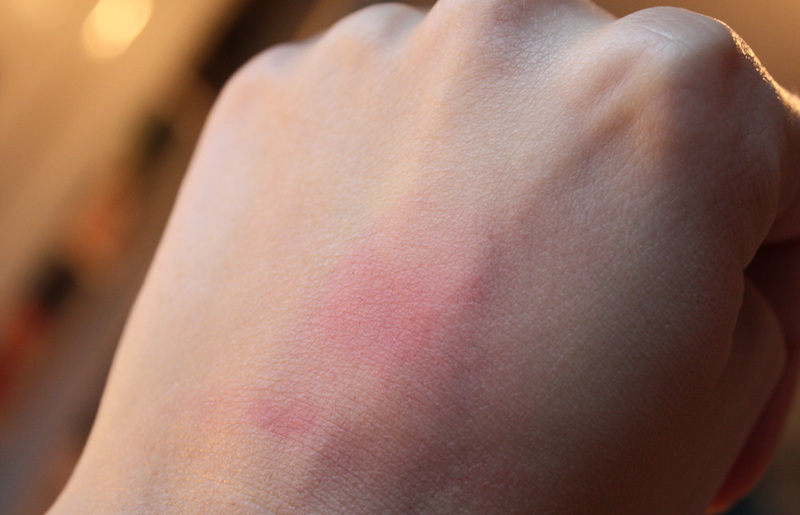 The product dries very quickly, so applying it as a blush could take a few attempts to get it right. It’s best to start using a small amount and increase it till you reach your desired look. (It’s easier to build up than take away as it will stain the skin). I found if you apply a small dot to your cheeks and rub the product in straight away using circular motions, you’ll get a natural rosy glow.